The latest game from Freeze Tag is a mystery detective game for PC and Mac based on the famous Victorian story by Wilkie Collins - The Woman in White. A spooky gothic detective game, that has you exploring gorgeous old mansions and locations to discover the identity of the mysterious woman in white. 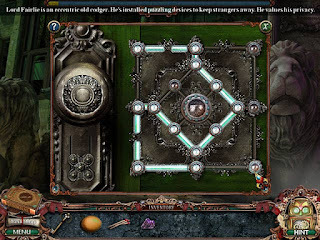 The gameplay involves hidden object gaming to find clues to solve this mystery, that will engage mystery fans and hidden object gamers alike. 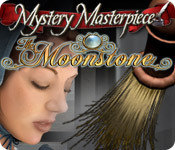 Also included in this post is details of the previous Wilkie Collins inspired PC detective game, The Moonstone, which currently has a free online mystery games version also linked below. * Plot: Who is this Woman in White and where did she come from? Walter Hartright, a poor drawing teacher, finds himself in the middle of an inexplicable mystery. Somehow his future is intertwined with an elusive woman who harbors a dreadful secret. A secret so damaging her life is in danger! 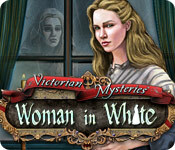 Explore Victorian mansions with gorgeous location, search for hidden objects and clues, uncover diabolical plots, root out the lies, and discover the truth in Victorian Mysteries: Woman in White. * My review: With the excellent story as the background to this mystery PC game, the game developers have done well to capture the atmosphere of the story, as well as provide plenty of interesting hidden object and puzzle games that suit the plot. But, it is a little on the sort side, so if you like to rush through HO games then this game won't last you very long. 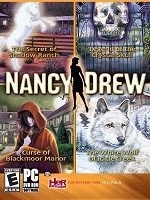 However, if you like to take your time, and enjoy the scenery, the mystery and adventure, and of course savour this classic mystery story in PC game form, then you will be sure to get more out of this game. * Plot: An ancient and priceless piece of jewelry, the Moonstone, has been stolen, and it's up to you to track it down! Investigate every person who was in the mansion at the time of the crime to solve the mystery and catch the crook, in this Hidden Object game! Explore every room of the mansion to find valuable clues in Mystery Masterpiece – The Moonstone, and return the jewel to its rightful owner. * My review: Based on one of the earliest ever British detective stories, this detective game for PC was very enjoyable, reasonably tough HO games, puzzles and great graphics. Definitely worth a play, and you don't need to know the original detective story beforehand. Try the free online version and let me know what you think. For more Victorian period PC detective games, see my previous posts on detective games for PC based on most famous fictional detective Sherlock Holmes and stories by Edgar Allan Poe: Fictional Detective PC Games.